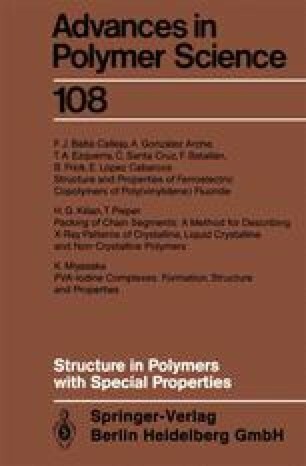 The aim of this paper is to review the main structural features and properties which are related to the ferroelectric behavior of copolymers of poly(vinylidene fluoride) (PVF2). These are illustrated by describing the conformation, polymorphism and morphology of PVF2 and its copolymers. Copolymers of PVF2 and trifluoroethylene have special interest because of their prominent ferroelectric behavior as well as strong piezo- and pyroelectric activity. The review covers the study of the influence of molar composition on structure and the temperature induced ferroelectric to paraelectric phase changes. Advances and problems in X-ray diffraction results relating to changes in the long period, size of coherently diffracting domains and lattice spacings with temperature are discussed. A microstructural model to explain the transformation of paraelectric into ferroelectric crystals when cooling through the transition temperature is presented. Special attention is paid to the influence which the changes in structure exert upon mechanical properties. The dependence of polarization upon copolymer composition and temperature is analyzed. Dielectric spectroscopy is shown to be of great interest in showing transitions connected with reorientation of permanent dipoles. Finally, new results on molecular dynamics of these ferroelectric copolymers derived from incoherent neutron scattering are reported.